Looking for a creative addition to your deck or patio? 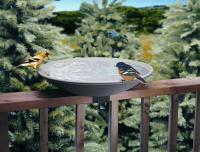 A deck bird bath is a great way to get up close and personal with your feathered friends. Our deck bird bath features a number of sculptured designs, all which are easily mountable on any deck rail. 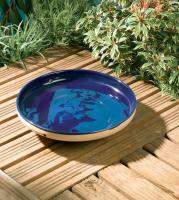 One of the most popular features of our deck bird bath collection are the many heated bird bath options. 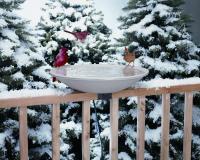 These bird baths are designed to keep water ice-free in harsh winter temperatures, ensuring that your birds can count on your deck bird bath as a source of fresh water all year long. Not sure what deck bird bath is best for you? Our friendly customer-service team will be glad to explain the features of the many different available models. In the great frozen winter of 2013-14we were worried this electric water source wouldn't stand up BUT it proved up to the job and performed above expectations.The birds, squirrels, and maybe even the deer love it.So do we, it's added a wonderful aspect to the backyard view. Go ahead and get it! 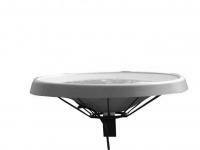 This heated birdbath was so easy to assemble and to attach to our porch railing. With below freezing temperatures the water remained clear and liquid. Being able to empty it by merely tipping it away from me is a bonus. It holds nearly 2 gallons of water. So far we are happy with our product. We had to laugh when the instructions said to keep it out of the wind! We live in Nebraska! We use it outside to water the backyard creatures...birds, squirrels, rabbits, deer, possum, woodchuck, etc. I love this birdbath, but "deck mount" does not work well. Myself and a friend bought this heated birdbath but it does not grip tight to the deck railing and it slips off very easily. Both of us had to secure it with a bungie-cord to our deck rails. Of course this negates the tilt feature, but at least it is secure. This is a great product - so EASY to empty and re-fill just "unclip" it from the deck railing and push it up to empty easy as well to clean just scrub a little and wipe up with a paper towel then refill. Big enough for the larger birds we have like dove, Baltimore orioles, etc.